Utilizing GaAs Schottky Barrier Beam Lead Diodes in balanced configurations, Waveguide Frequency Mixers comeÂ in 6 down-conversion and 6 up-conversion models,Â covering full Ka, Q, U, V, E, and W millimeter wave bands. Units operate over RF and LO frequency bands from 26.5–110 GHz with IF frequency covering DC–18 GHz. Depending on model, conversion loss ranges from 6–9 dB typical with 20 dB RF to LO isolation. Mixers are supplied in rugged gold-plated package, in sizes from WR-28 to WR-10. Irvine, CA – Pasternack, a leading provider of RF, microwave and millimeter wave products, adds new millimeter wave (mm-wave) waveguide frequency mixers available in six down-conversion and six up-conversion models that cover full Ka, Q, U, V, E, and W bands. Designs utilize high performance GaAs Schottky Barrier Beam Lead Diodes in balanced configurations that require a +13 dBm LO drive and display low levels of conversion loss. Pasternack’s new waveguide mixers, also referred to as waveguide converters, are a key building block component of mm-wave receivers used to down-convert very high frequency signals to usable RF frequencies for cost effective signal processing. They are also very useful for test and measurement applications to convert signals to frequency levels that can be measured with available equipment. Similarly, these mixers can be used to efficiently up-convert RF signals to millimeter wave frequencies for point-to-point radio and millimeter wave radar applications. The new waveguide frequency mixers from Pasternack operate over RF and LO frequency bands ranging from 26.5 to 110 GHz with an IF frequency covering DC to 18 GHz. Depending on the model, conversion loss ranges from 6 to 9 dB typical with 20 dB typical RF to LO isolation. Maximum RF input power is +5 dBm and performance is specified over an operating temperature of 0°C to +50°C. 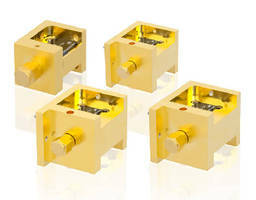 Rugged gold plated package designs are thermally stable for high reliability and feature compact dimensions with integrated waveguide sizes ranging from WR-28 to WR-10. The new waveguide mixers from Pasternack are in-stock and ready to ship now. For detailed information on these products, please visit http://www.pasternack.com/pages/RF-Microwave-and-Millimeter-Wave-Products/millimeter-wave-waveguide-frequency-mixers.html. Pasternack can be contacted at +1-949-261-1920.